Watching my daughter’s face light up as she pulls a carrot out of the ground, I am reminded why we keep a garden, year after year. The pride and pure joy are overflowing. There is no greater gift I can give my children than to teach them to grow their own food, from seed, to harvest, to plate. 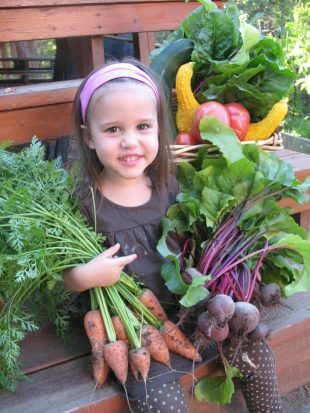 When children learn to grown their own food, they are naturally excited by the food they grow, whether it is red or orange or green. For a child, the connection between a growing plant and the food on their plate becomes tangible. It is something they can believe in because they understand the process. Becca – what a sweet picture of sofia with her veggies. The opportunities you are giving her will allow her to appreciate where our food comes from, I absolutely love it. I wish I had it in me to do more things like this. And you are a great writer. Amazing writing. I’m not sure if I can read all of these without crying. Is that sappy or what? Sofie will be greatful.